Last year you read a pamphlet from the Cambridge Public Health Department about the dangers of the West Nile virus. You wrote a blog entry about that virus, mosquitos and malaria. You had lots to say about mosquitos and malaria given your history and your Ghanaian background. 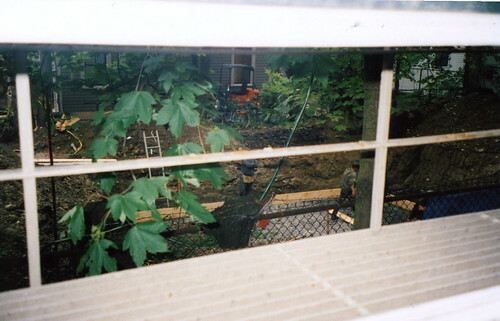 Then one morning this past April, you woke up to the sounds of bulldozers digging a foundation in the adjacent house right outside your bedroom window. Thenceforth every morning at 7:30am, the fun starts with construction noise. It's not as bad as last year when it was construction two houses over. So far they don't have the loud guys, those guys with the booming South Boston voices who wrangled the construction crew and kept the lazier folks on their toes. You got an education on the intricacies of construction work and mentoring on the job. Its a different crew this time, they're more experienced and barely talk to each other. The real-estate bubble is in full gear in metropolitan Boston and in Cambridge it is reaching fever pitch. Everyone is building new houses in their backyards or doing home improvement. The developers have moved in, The Locals are moving out - priced out and heading to Medford and beyond (even Somerville is getting too expensive). Gentrification is proceeding apace. In any case, this year you've been waking up even earlier because of the quality of the early morning light so you aren't woken up by the construction. It simply disturbs your early morning reading and writing. You get used to the noise after a couple of weeks. At some point it rains heavily, it's late spring weather. A week or so later, you walk into your apartment one night and notice a mosquito (you wonder if a window is open); you kill it. You've had malaria bouts in the past and have lost your immunity. Thus you are very sensitive to their presence and can't bear these creatures of God. A few days later you enter your bedroom at night and notice that this time there are plenty of mosquitos - you spend a half-hour killing them before you go to bed. You check to see if your window nets have holes in them. Everything looks ok. A day later The Girlfriend mentions in passing a report predicting that Boston will be the prime capital for West Nile Virus this year. You shrug. West Nile virus has spread all over the US in any case. You come back from work that night and again find your bedroom teeming with mosquitos that buzz around your head as you doze off. Again, lights on, grab the nearest newspaper, curl it and hunt for those pesky insects. The result is a few stains on the wall. You'll wipe the wall later. You wake up the next morning. It's a lovely day. You lean out of your window. It's 7am and those construction folks have started early. Then it clicks. You observe pools of stagnant water in the foundation hole. You've read about stagnant water in some pamphlet before. You lean out of your window and take a photo. The construction workers notice you and make a wisecrack. You ask them when they'll finish construction. "Maybe by November." "What about the foundation?" "Maybe August." "Nah, July. Are you crazy?" "Hey. I want a copy of the photo". "Sure man". You're still a 35mm luddite so 2 weeks pass before you develop, scan and post said photo on Flickr. Days later, while waiting for a server to restart, the bane of a developer's life, you write a short blog entry about said construction site. You make a note to add to your shopping list: Insect Repellant Spray (Deep Woods Off with at least 15% DEET). You wonder if you won't need to buy Mosquito Coil or some heavy duty spray like they use in Ghana for your apartment to control the infestation. You remember that malaria was a problem in New York as late as 1950 and similarly in London and Paris. The problem being insanitary living conditions and the proverbial stagnant water pools where mosquitos breed. Who would have thought that normally cold Boston would have an issue with mosquitos? You say to yourself that it is futile to call the Cambridge Department of Public Health: until the foundation is done, it will be a big hole and breeding pool. Your only hope is heat and global warming to evaporate the water. You realize your biology is faulty: the warmer it is the more mosquitos there'll be. Oh well. You look out again and notice more pools of stagnant water gathering. There'll be fun in Boston this summer and especially in your neighbourhood. Maybe with West Nile Virus ascendant and mosquitos everywhere, someone will finally focus on finding a cure for malaria. Maybe with US soldiers hallucinating because of Larium and going on homicidal rampages, someone will fund research into better drugs for that disease. In any case, you welcome the US to the fun of the Third World. This morning they begun pouring concrete, cement or something or other into the foundation. They must be moving ahead of schedule. Hopefully the mosquito infestation will be soon be tempered as the stagnant water is drained. Ironically the nuisance is now the noxious fumes that emanate from the pit as they mix and pour whatever chemicals. The Girlfriend run precipitously from the apartment when she smelled that concoction. I don't like your apartment.